Mike Caruso, Orland Park Consolidated High School District 230, USA "The savings that I am making on updates and my 1:1 scheme are phenomenal. CACHEBOX has completely cut down the congestion on my network." Louis Webb, Nueces Canyon CISD "We have a 70 Mbps connection and CACHEBOX is showing us savings of 11.74 Mbps." Where bandwidth saving is a key driver and extra bandwidth is moderately expensive or worse, a quick calculation demonstrates the benefit in simple cash terms. Rapid payback often makes it a no-brainer. If user experience is the issue rather than bandwidth per se, then calculating the benefits in money terms is more complicated, but a compelling case based on other measures is often obvious. Bandwidth savings translate directly into financial benefits as they allow you to a) use less bandwidth on a metered connection, b) delay bandwidth upgrades or c) fit more users onto existing connections. With metered bandwidth, the calculation is very simple. Say you use 10Gb per month at a cost of $500 per Gb, so your monthly cost is $5000. Savings = $5000 x (30/100) = $1500 per month. 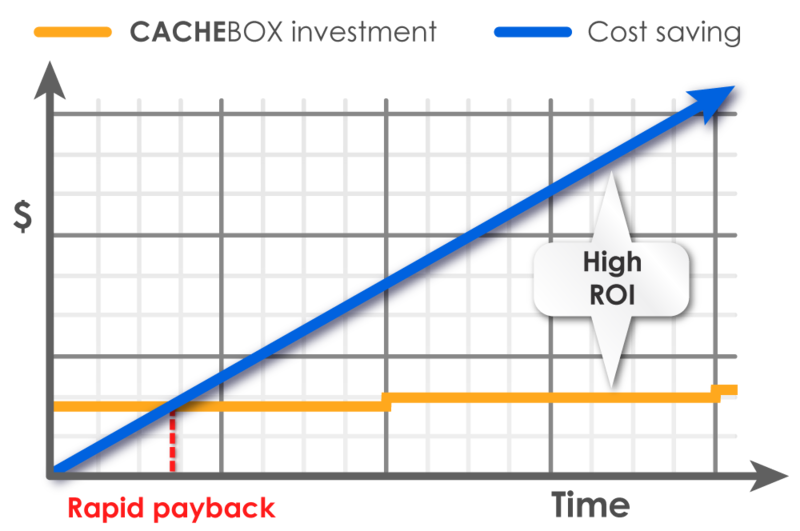 With CACHEBOX, you’d see payback in just a few months and save $18,000 per year thereafter. 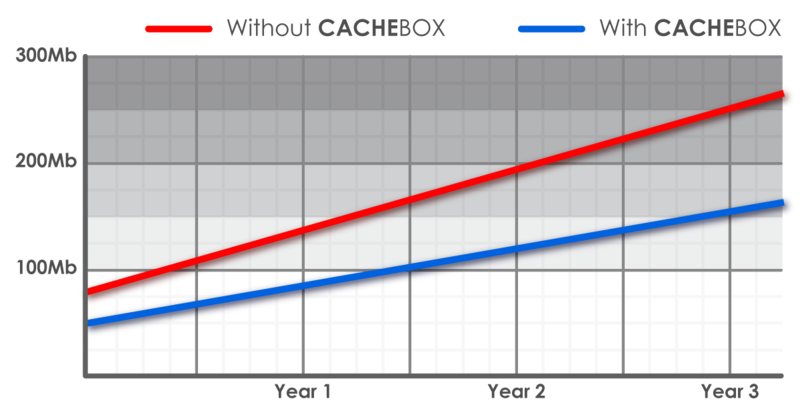 Using a cache lets you delay an upgrade to your bandwidth as your traffic grows. 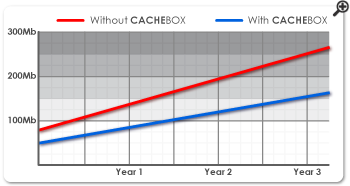 After you upgrade, caching continues working to save you bandwidth and delay future upgrades. You continue to save money month after month. 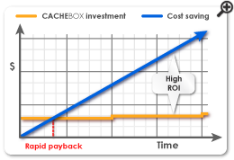 It’s not all about cash savings, caching can help you to grow revenue too. Taking an ISP as an example, if you have 1500 customers each spending an average $25 per month and you expect your hit rate to be 35%, your current monthly income is $37,500 and caching could help you make an additional $13,125. That’s over $150,000 per year, dozens of times higher than the cost of an average CACHEBOX. In a school, you’ll see less wasted lesson time, giving teachers the confidence to use online learning resources in the classroom. So you’ll spend less time dealing with bandwidth related support issues, improve your user satisfaction rate and gain the bandwidth to support 1:1 (student:computer) schemes. For ISPs, in addition to bandwidth savings, you can typically provide a speed increase for customers of around 20-50%. An increase of this magnitude leads to increased customer satisfaction, reduced churn-rate, lower marketing costs and an opportunity to increase Average Revenue Per User (ARPU). In an enterprise, with drastically increased download speeds you’ll see enhanced employee productivity, spend less time dealing with bandwidth related support issues and improve your user satisfaction rate.